Last year I went to Sicily for the first time in my life. We stayed at a beautiful farm close to Noto located in soft hills between lemon, orange and tangerine trees. Every morning we got the most delicious breakfast served under pine trees with the old city of Noto in the distance. Freshly baked cakes, fruit, white bread fried in olive oil together with oregano (from the farm as well, the best oregano in the world! ), it was heaven! One of my many breakfast discoveries was a jam which looked like the golden sun and tasted so sweet and refreshing, with a hint of sourness and bitterness. Just divine! 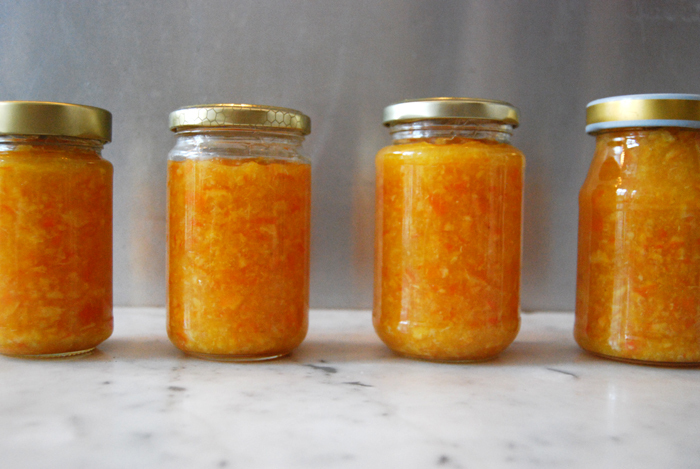 This jam was made of tangerines and I think I must have emptied jars of it during our holiday. 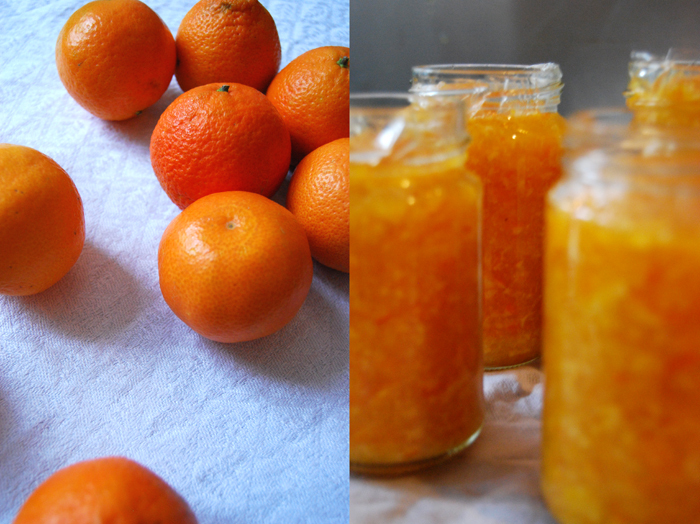 As soon as I got home and tangerines were available I made my own! This year, I have to refill my pantry with my Sicilian jam. Sterilise the 4 jam jars in boiling water for 5 minutes. Fill a large pan with water and bring to the boil. Put the tangerines in the water and let them boil for 20 minutes. Take the tangerines out and keep some of the water. 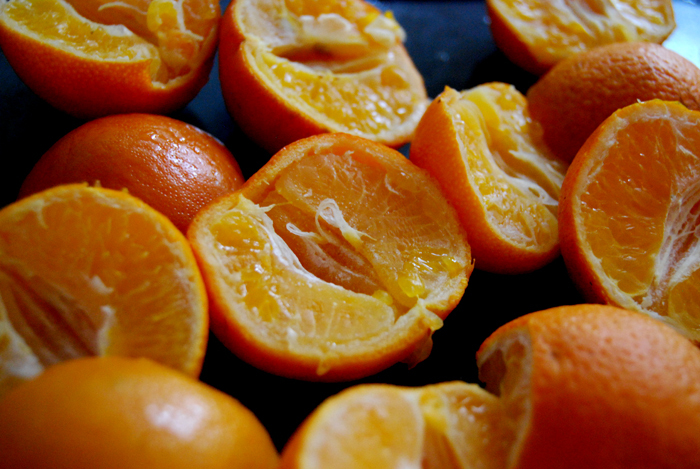 Quarter the cooked tangerines (don’t peel them, you use the whole tangerine! ), take out their seeds and put them aside. Cut the lemons in half and keep their seeds as well. Heat up some of the tangerine cooking water in a small pan (it should come up to 2cm / 3/4″), add the lemon and tangerine seeds and let them cook for 5 minutes. 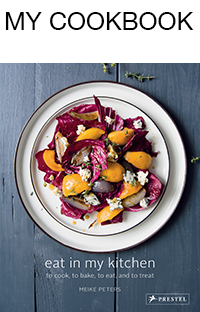 Shred the quartered tangerines in a food processor for a few seconds. Put them in a large pan, add the sugar, the lemon juice and the water used to boil the seeds. Bring to the boil gently (the sugar has to dissolve first) and boil everything for 18-20 minutes. Dip the rim of your jars in the spirit and wash out the lids of the jars with the alcohol as well. Fill your jars with the jam and close well immediately. Let the jars cool off and enjoy their amazing color – and the taste after a day or two as the jam has to sit a bit!